The Honda City is one vehicle which has changed the perceptions of many people with an entry-level sedan. With the comfort and features comparable to sedans one segment above offered at a competitive price, the City is one of the highest selling models for Honda globally, especially in emerging markets of Asia, including Malaysia. The current design of the exteriors, as well as cabin layout, might have aged in today’s date, but they still manage to look premium and classy, thanks to the aerodynamic design of the car. The strongest attribute of the Honda City remains its rear seat comfort, which is simply the best in class. All the variants of the Honda City source their power from a very refined and rev-happy 1.5-litre four-cylinder petrol motor coupled to a CVT gearbox, which belts out a maximum power output of 120 PS and a peak torque output of 145 Nm. City is available in 5 different colors - White Orchid Pearl, Crystal Black Pearl, Modern Steel Metallic, Lunar Silver Metallic and Dark Ruby Red Pearl. Honda City is undoubtedly one of the most successful ventures in the passenger automobile history. Starting from 1981, the car has been the first choice for both first-time as well as experienced buyers. The current sixth generation of the sedan was launched in 2014 and has seen the popularity surge higher. At the time of the launch back in 2014, the sixth generation Honda City was available in four trim levels, all of which had a CVT gearbox in them. However, after the facelift in 2017, the company discontinued the S+ variant, replacing it with a hybrid version, being inspired from the Jazz hatchback. This, of course, made Malaysia the second country after Japan and the first ASEAN country to have the hybrid City on sale. Hence, presently we have the hybrid version Honda Jazz and City, where both use the same engine and mechanism, with identical power figures too. Another good thing is that the hybrid City is assembled locally in Pegoh, Melaka. The cabin of the 2018 Honda City is unforgivingly luxurious and has always been so, compared to the contemporary peers. The center console and the dashboard look quite similar to the pre-facelift model in the sixth generation. However, the new thing is a 6.8-inch touchscreen infotainment system in the dashboard, which the company claims to be smoother and more responsive than the previous iteration. The cabin looks quite spacious and is definitely so, despite having a huge cargo space of over 500 litres. However, the best thing about this 2018 Honda City is that the company has offered a paddle shifter at the steering wheel even for the E and V trims. Once the paddle shifter is activated, the CVT gearbox becomes a 7-speed unit. There is one thing that you will dislike about the dashboard of the sedan, which is the lack of Apple CarPlay or Android Auto compatibility. Hence, the drivers will have to connect their smartphones to the system via Bluetooth or an HDMI. Another interesting thing about the dashboard is the addition of a touch panel AC control, which means the physical AC knobs are no longer present. Visually, the 2018 Honda City is a treat to the eye and is probably the most attractive B-segment sedan the company has ever produced. The latest facelift has seen the car get sleeker, especially on the front. The thick strip of chrome that passes through the grille is now slimmer and exposes a good bit of the mesh grille. The body looks somewhat sculpted to add to the sporty feel. The two lower trims ride on 15-inch alloy wheels while the top trim and the hybrid version get 16-inch units. The rear quarter of the car looks unbelievably attractive, especially for the way the sharp body lines pass over the rear wheel arches to flow into the rear profile smoothly. There are LED head and tail lights, along with the addition of brake lights on what the company calls Ducktail Spoiler. The wing mirrors fold automatically when the car is locked. Overall, the latest facelift of the Honda City is a well-executed improvisation over the previous models and embraces the sportiness without shouting it loud. This means, despite being sculpted, the edginess does not appear to be forced but looks more like it is smooth. Honda City sits pretty on top of its competition in this segment, much credits to the continuous variable transmission. This is a special type of transmission employed in Honda's vehicle making use of Honda's patented Earth Dreams technology which directly boosts up your fuel economy, making the mileage of Honda City rise to an highly impressive 17.56 km/l mark, this technology being eco-firendly benefits the ecosystem and benefits your wallet. 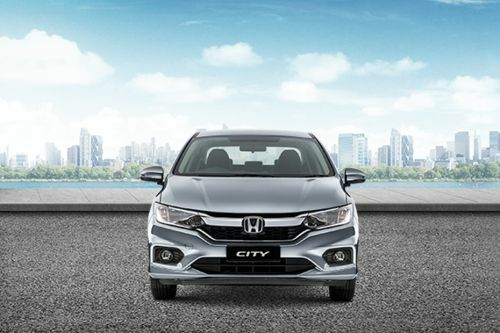 You simply cannot get enough of the Honda City, especially when you know that it is not only a wonderfully-designed sedan but also has an engine which is quite powerful. The S, E, and V trims of the City are powered by a 1.5-litre, four-cylinder, petrol engine, which can churn out a maximum power of 120 PS at 6,600 rpm along with the peak torque of 145 Nm which comes at 4,600 rpm. The power is sent down to the wheels via a CVT gearbox. On the other hand, the hybrid model is slightly more powerful and has the same 1.5-litre, 4-cylinder petrol engine making 110 PS power at 6,00 RPM and 134 Nm torque at 5,000 RPM. However, these figures are combined with an electric motor, which further makes 30 PS of power and 160 Nm torque. The combined output in the hybrid trim stays at 137 PS power and 170 Nm torque and is routed to the wheels via a 7-speed Dual-Clutch transmission. Honda did try to make giant improvements in the hybrid over the ICE version, but still, we feel that the engine is not as smooth as it should have been. However, the biggest positive of the electric motor is that the 30 PS of additional power and 160 Nm torque is very evident while on the drive. The petrol trim of the 2018 Honda City is, as usual, extremely smooth and does not let off its guard even for the least amount of time. The Honda City is definitely one of the safest cars in the B-segment sedan space and offers a lot of such features at that price. A total of six airbags are offered, despite the fact that the car is built with a G-Force control technology on the body frame, which absorbs a lot of the impact at the time of an accident, minimising the injuries on the passenger. All the four wheels get ventilated disc brakes. Moreover, the addition of ABS makes sudden braking safer. It also has the ESS (Emergency Stop Signal), which activates the flashing of hazard lights if sudden braking is applied, thereby sending a warning to cars around. Some other features include the ISOFIX, 3-point ELR seat belts, along with HSA (hill start assist), which prevents the car from rolling backward on an incline when the brake is released. The Honda City is a very smooth car to drive with a very stable electric power-steering and VSC (vehicle stability control). The MacPherson Strut front and Torsion beam rear suspension absorb most of the bumps that you may fail to dodge at the open roads. What are the Safety Features Available in Honda City?